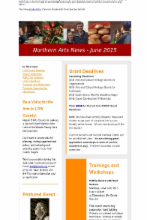 We hope you will take some time to read the June 2015 edition of Northern Arts News! Read Northern Arts News and stay in touch with the arts in our region! Next postTwo Region 2 Arts Council Grant Applications Are LIVE!